This entry was posted in Uncategorized on June 16, 2014 by admin. 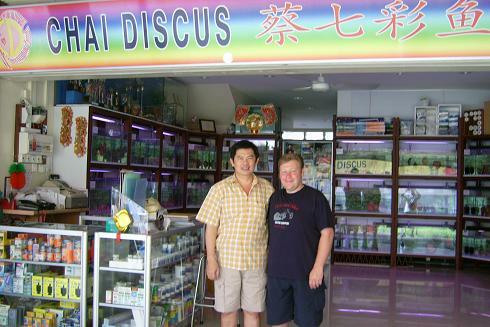 Welcome to Plymouth Discus Far East page, here you will find the many visits I have made to the Far East in search of top quality Discus, to ship out through the UK. 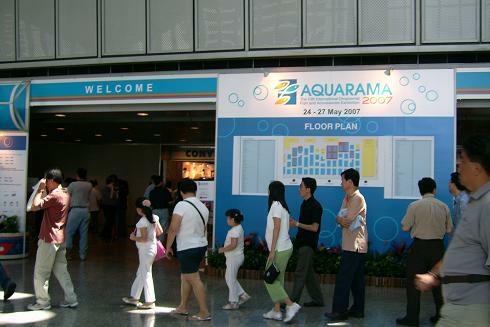 The 2007 show was moved to the massive Sun-Tec international convention and exhibition center Singapore which is the capital of the world for fish keeping, and after attending the show we found it is easy to see why. 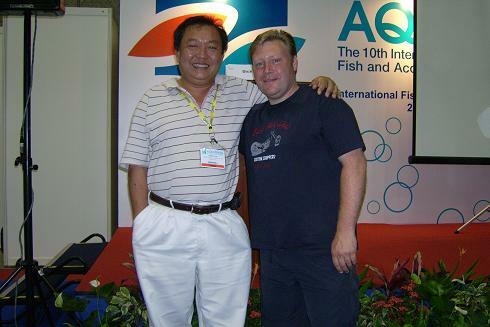 It was great to meet, once again Heiko Bleher at this years Aquarama. It was great to catch up since the last show, and exchange ideas. 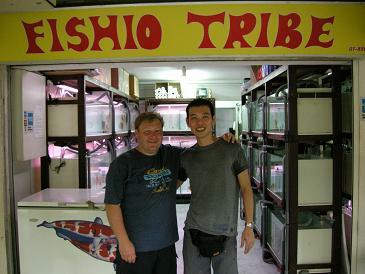 Herman Oei from Asher Discus, Indonesia with Chris Ingham at Aquaramma. Having a little fun with my great friend Andrew Soh sharing some humour and fortune telling!!! 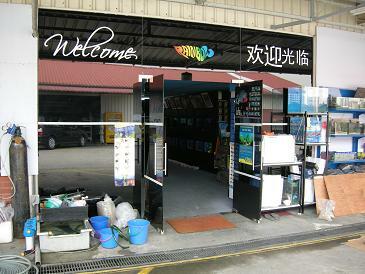 Plymouth Discus’s Owner has visited over 32 fish farms in Singapore, here are some of the best.Well it had to be done. 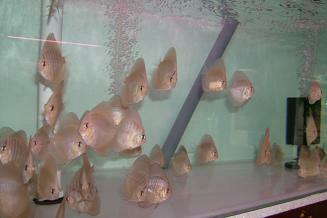 what would a visit to Singapore be without seeing the Chai’s Discus Farm. 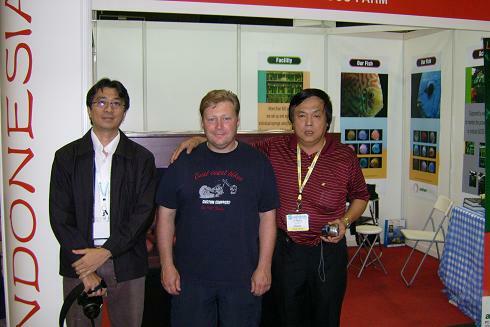 Since winning many awards, the last being grand champion at Germany’s 4th international championships 2002, Chai does not show his first class Discus anymore and just spends his time breeding his fish. 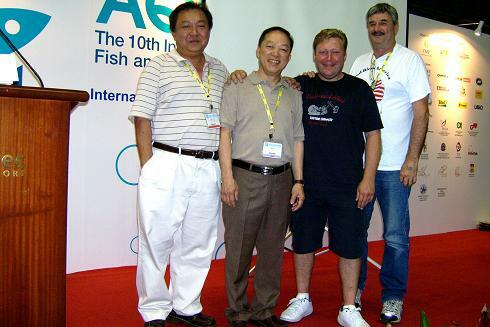 I first met David Lim owner of Fishio Tride at an English Discus show, since then I have met up with him at many International discus shows over the years. 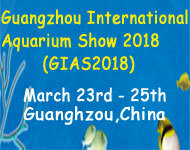 Rainbow Discus breeding farm is one of the largest hatchery’s for Discus breeding, with more farms in China and Malaysia this is over 3,000 tanks! 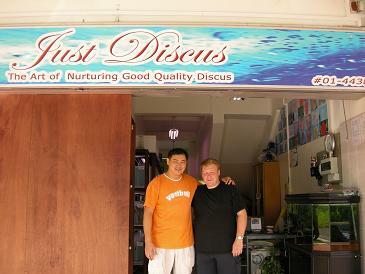 Just Discus is owned and ran by Albert Tan. 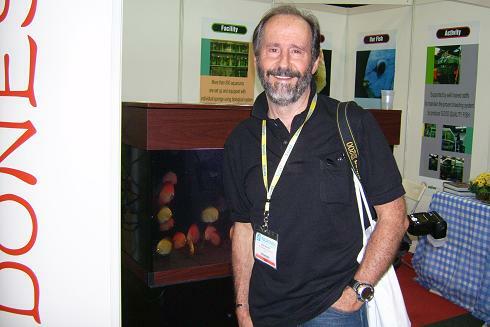 On this visit he had many top class fish on show and even let me out to the hatchery which some breeders are not happy to do.